SEASONS IN THE OKANAGAN straddles forty acres of gentle rural hillside above scenic Okanagan Landing. A sensitive balance of homes and recreation facilities. Close to all your Okanagan favorites – wineries, golf, skiing, watersports are all within view of Seasons. Surrounded by country lanes and sandy Okanagan Lake beaches. A place for the entire family to enjoy the seasons. 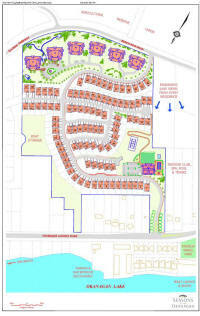 Follow this link to our download PDF version of our community site plans (1425 KB). A new window will open, close the new window to return. Visit us or contact us today to arrange your personal real estate tour of these rare lake view properties in Okanagan Landing, Vernon, British Columbia. We welcome you to discover Vernon BC resort real estate at Okanagan Lake.